This guide reflects the latest tools, technologies, tactics and other developments in the field of internet politics, including the latest innovations in the 2018 U.S. election cycle. It also includes photos and images from current campaigns to illustrate and illuminate each chapter. It’s by far the most comprehensive guide to using the internet for politics and advocacy available. More about the book, including a list of chapters. 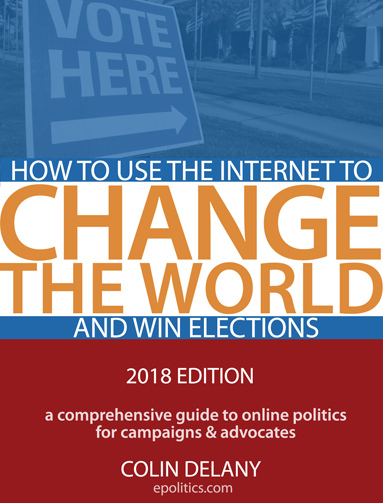 “How to Use the Internet to Win Change the World – and Win Elections” is a comprehensive guide to effective online political campaigning and advocacy. This new 2018 edition is expanded, rewritten and reorganized to highlight the latest developments in the tools and tactics of online politics. The 2018 edition includes entirely new chapters including ten big trends to watch throughout the 2018 digital campaign. It’s also updated to reflect the latest developments in social media, digital advertising, mobile technology, online fundraising, campaign data and more. As well, it includes sections on newer political tools like Instagram and the video-streaming apps Periscope and Facebook Live. Incorporating important lessons from the recent elections in the U.S. and around the world, this book is essential for anyone running for office or trying to influence public opinion and public policy in 2018. It’s also extremely useful for individual activists, nonprofit political advocates, academic researchers, students and journalists. It’s the most comprehensive guide to digital campaigning available and a must-read for anyone interested in understanding how modern politics is done. “How to Use the Internet to Change the World — and Win Elections” is written by Colin Delany, a twenty-two-year veteran of internet politics and advocacy, a sought-after consultant and speaker, the founder of Epolitics.com and a columnist for “Campaigns & Elections”. As a consultant, he has worked with scores of nonprofit groups, candidates and companies to help them achieve their advocacy, electoral and communications goals using digital tools. This e-book reflects his own years of experience as well as lessons learned from campaigns and advocacy organizations across the political spectrum.